Arsenal forwards Alexis Sanchez is on his way to Chelsea. Maybe. 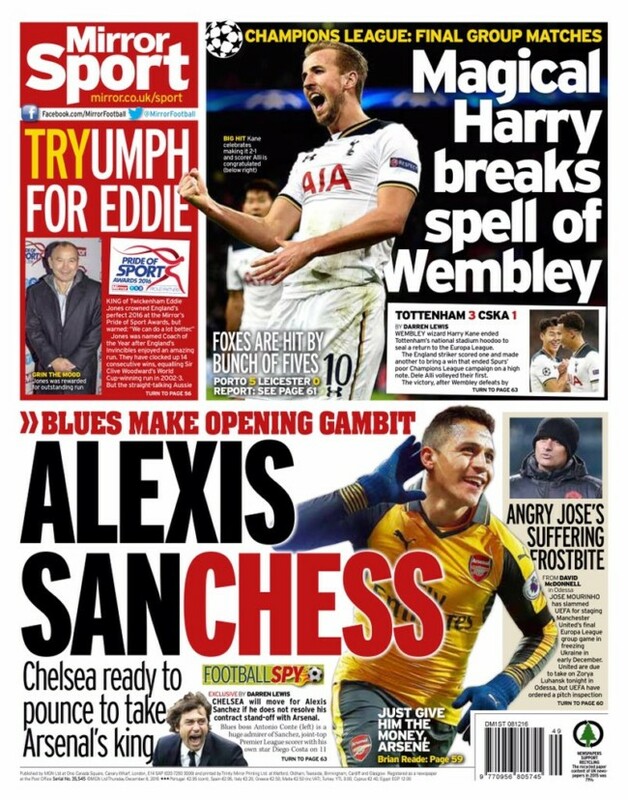 The Mirror leads with news that should Arsenal fails to give Sanchez the massive pay hike he wants, Chelsea will dip him, his dog, his mum and his house in Russian gold. The root of this story is not guessology, but something close to it. The Mirror says Chelsea manager Antonio Conte really likes Sanchez, arguably the Premier League’s best player. And, er, that’s it. This ‘news’ follows yesterday’s ‘news’ that Chinese investors are willing to spirit Sanchez to the Far East an pay him £400,000-a-week to kick a ball. You’d imagine that any club willing to pay that much will also pay an enormous transfer fee. Of course, we only know about the Chinese interest because Sanchez’s people have dropped it into conversation with Arsenal over a new deal. It’s a bit desperate from them. If he fancies it, he’d already have agreed to go and Arsenal would be talking about that massive transfer fee. So Sanchez won’t head to China. He’ll stay in Europe, and if he and Arsenal are smart he’ll stay at the Emirates and earn closer to the £200,000 a week he wants.